Lately, as periodically happens in the Mormon blogo-world (someone should think of a catchy nickname for that, like "blogference" or something. Like, blog conference. Get it? )...anyway, lately the venerable Meridian Magazine has been a topic of discussion in some circles. The online independent LDS magazine has recently produced, among other things, a...fascinating...attempt to harmonize a literal Genesis flood account with modern science, a fawning paean to...err...men, and a scathing attack on the Ordain Women Movement and its secular media enablers. However, I've noticed that some people seem to miss the point of articles like this when discussing them. 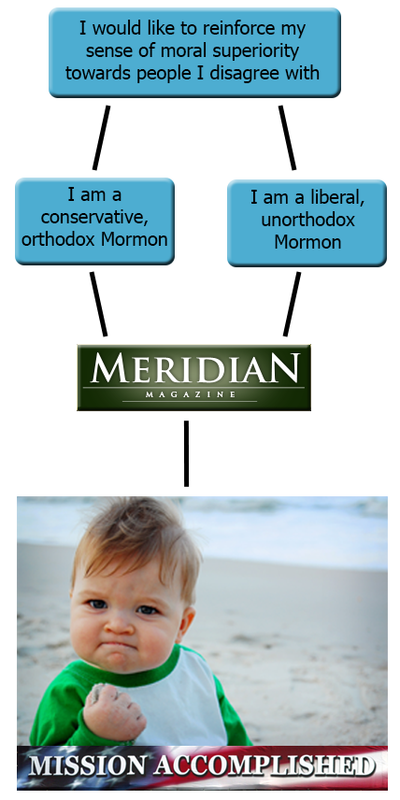 Therefore, as a community service I produced this thoroughly researched yet immediately accessible visual aid demonstrating Meridian's manifest value to the online LDS community, which in many ways goes to the very core of our religious identity. Enjoy.